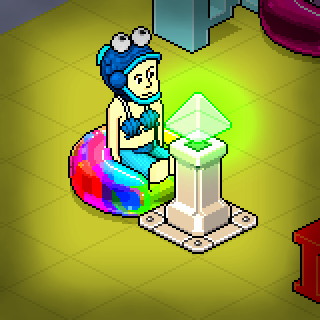 Winner of a Habbo Mall room competition. Come get lost in a plethora of norms!! The perfect home for any small family! Join group and come back soon! King cake and pancakes are the house special! Ideas and suggestions for the Habbo Design Team. Habbo University co-ed dorms for role players. Made by .!aLi!. Gallons and Banned00. Badge for Habbo University faculty and student council members! If you want to join the staff, request membership and post in the forum! An esteemed learning facility, built by .!aLi!. and Gallons. To join the staff, contact .!aLi!. A lovely group of homes for you to enjoy with your family! Made by .!aLi!. and Gallons. For the beta testers of the new navigator. Bring in 2015 with a BANG (literally). The climax of the film, the seven samurai defend their mountain village from the terrorizing bandits. The battle takes place in a torrential downpour. Who will come out victorious? scramble me, boil me, fry me, poach me, devil me, egg me. Come here for some drinks and fun times with friends! Celebrate the year of the Rooster properly! Sirens in the distance and searchlights filling the sky - everything the Neo-Habbo citizen could need to stay on the grid. "I've… seen things you people wouldn't believe… Attack ships on fire off the shoulder of Orion. I watched c-beams glitter in the dark near the Tannhäuser Gate. All those… moments… will be lost in time, like ... tears… in… rain. Time… to die…"
What treasures can you find? The climax of the film, the seven samurai defend their mountain village from the terrorizing bandits. The battle takes place during a torrential downpour. Who will come out victorious? Taken in this room on 11 December 2015 and received 5 likes. Taken in this room on 11 December 2015 and received 0 likes. Taken in this room on 5 December 2015 and received 1 likes. Taken in this room on 20 November 2015 and received 1 likes.